Mondi, the international paper and packaging group, has introduced to markets a plethora of innovations in recent months including the Splash Bag that resists rain water up to two hours, the AirXLiner CCK, the first structured clay-coated kraft (CCK) paper liner ever developed and the aqua protect brand, a sustainability and quality trademark for packaging solutions using ProVantage paper grades. Mondi’s Splash Bag was developed in response to lively customer interest in rain-repellent paper bags that while resisting rain for up to two hours withstand humidity better than a standard paper bag, the company stated. Standard paper bags for packaging cement and other powdery products are generally vulnerable to rain. To tackle the issue, Mondi, working in collaboration with major cement producer Lafarge, developed an innovative rain-repellent bag particularly suitable for cement. Its outer ply of Mondi Advantage Protect sack kraft paper has a water-repellent surface and is formulated to keep high tensile strength even in a wet environment. It also helps prevent moisture ingress if conditions are damp or humid during storage. Advantage Protect sack kraft papers have a water-repellent surface and are formulated to have high tensile strength, to help prevent rupture. For example, Advantage Protect in a grammage of 80 g/m2 has a tensile strength of 5.6 kN/m in the machine direction – an impressive figure. “Water gathers on the bag’s surface without being absorbed, then evaporates over a period of several minutes, leaving the bag essentially dry,” explains Claudio Fedalto, deputy COO, Mondi industrial bags. “By contrast, the standard bag absorbs the water, weakens as a result and may potentially rupture if exposed to extremely wet conditions,” he adds. 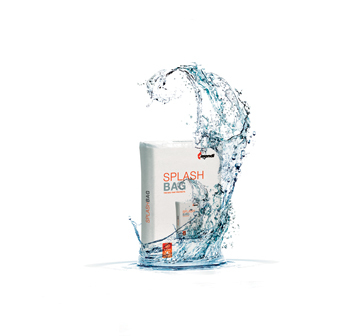 Results of Cobb tests, which measure the amount of water absorbed into the surface by sized paper over a set period of time, indicate that Splash Bags are resistant to rain for nearly two hours. If inadvertently left in damp (rather than wet) conditions, for example on damp sand, Splash Bag resists moisture ingress for up to 12 hours. Even after two hours of direct exposure to rain, Splash Bags can be moved, handled and emptied without any difficulties. Excellent moisture resistance can also mean better protection of the filled-in goods if conditions are damp or humid at the warehouse. Mondi also launched the AirXLiner CCK, the first-ever structured clay-coated liner for self-adhesive products. As a CCK-based liner, the AirXLiner allows faster converting speeds and prevents bubbles from forming during the application of a self-adhesive graphic arts product to its end use. AirXLiner CCK can thus be used for a variety of products. Compared to PCK liners, CCK liners are more heat resistant and allow higher converting speeds during production. CCK liners are found mainly in plotter film applications and over-laminating films. The new “aqua protec” trademark allows Mondi customers to brand their corrugated boxes with a quality and sustainability logo, helping to underline its water-resistant properties and guaranteeing that it is made from the eco-friendly ProVantage Kraftliner Aqua and/or Fluting Aqua paper grades.